It ran from the M1 at junction 7. It opened on the same day as the M1 and M45, in November 1959. However, after a long, slow and drawn-out death, it was killed off on 1 May 2009, just a few months short of its 50th birthday. What makes this this a pathetic motorway? 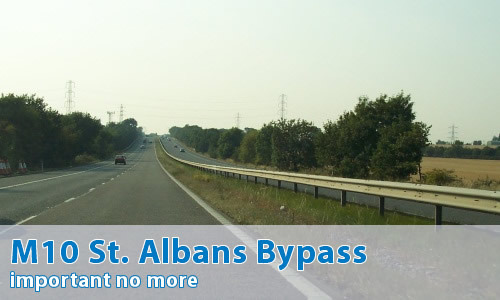 It's just under three miles long, and today just forms a southern access road to St. Albans. It gives up short of the M25, meaning that in modern times, it is just an attempt to cut the corner off and doesn't actually manage to achieve it. Nowadays it's not even a motorway, just part of the A414. This was achieved during the completion of the M1 widening works in the area by simply adding an extra lane (with barriers!) from the M1 end of the former M10 up to junction 8, thereby allowing non-motorway traffic its escape route. It wasn't always this way, though! It's a leftover from the one earliest days of motorway building in Britain. When the M1 was first built, it went from the current junction 5 to the current junction 18. In a surprising moment of stunning intellect, the likes of which have never been seen since, the (then) Ministry of Transport suddenly worked out that they were building a wonderful three lane motorway which would zoom traffic towards (and away from) London. Unfortunely, there were no other motorways for it to connect to (save the Preston By-pass, some 130-odd miles away...) and so if you can imagine three lanes of fast traffic suddenly hitting the 1950s network and coming to a grinding halt at either end! The answer - get as much traffic as possible off the motorway system before the end, hence the M10 and its sister motoway, the M45. Are there any other claims to fame? Yes, the M10 ended at Park Street Roundabout. What on earth are you ranting about now - I don't live anywhere near! Park Street Roundabout is the roundabout that's appeared in the Highway Code (and many road atlases) for many years as the "example" one. Exciting, eh? Hmm, I'm not convinced. Can we go onto the photographs now? Yes! Visit this page for comments on the M10 and M45.